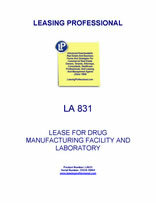 This lease form is for a drug manufacturing tenant that will also use a portion of the space for laboratory purposes. The form contains extensive environmental protection for the landlord. It also contains customary pro-landlord provisions concerning operating costs, use, alterations, and construction of tenant improvements for the premises. 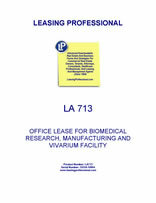 This lease form is designed for a biomedical manufacturing facility located in a multi-tenant office building. The lease grants the tenant renewal options for the premises at fair market rentals. The landlord provides a construction allowance for the premises for improvements in excess of building standard items. Exhibits include Work Letter, Building Standards, Letter of Credit Specifications, and Rules and Regulations.